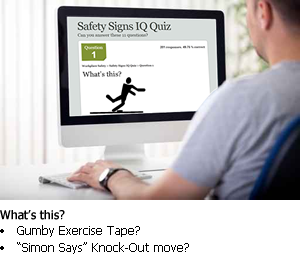 This hilarious quiz shows why so many safety signs are too easy to ignore. Spot signs that should never have made it into a competitor’s sign catalog. This test has been taken 1,000’s of times and is sure to bring a smile to your face. But, remember, no matter how misguided a symbol can be, we all believe that safety is no joke. Better symbols and better safety signs save lives! Download a free PDF of some hilarious safety signs. Post signs around your office or room. Make sure that everyone knows that a sense of humor is sometimes the best way to get through the day safely.